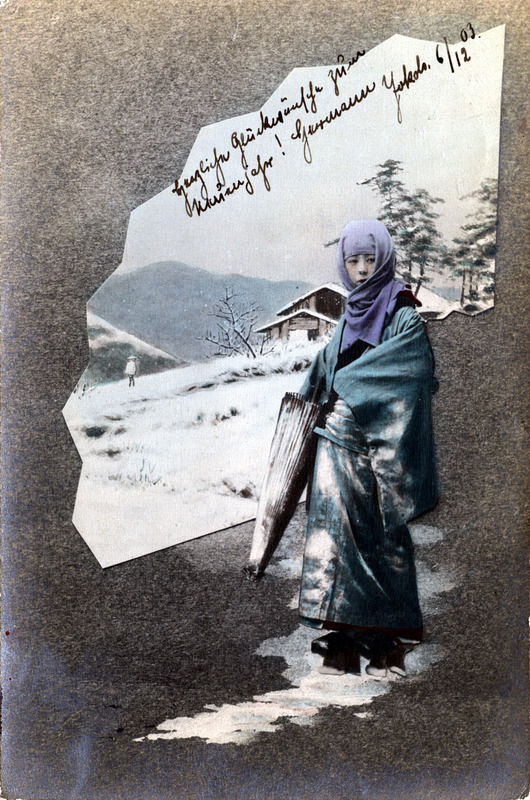 Winter scene, 1903. A young woman dressed with heavy winter kimono and head scarf, wearing geta, tracking through a snowy mountain village. “In the valleys of this part of the country deep snow covers the ground throughout the winter, and the sky is wrapped in a dark veil of clouds so that bright days are a rare phenomenon. ‘It looks as though it were always going to rain,’ a native of this district expressed himself to the writer with regard to this appearance. This description applies especially to the provinces of Kaga, Noto, and Echiu, but Echigo, Shonai, and Akita also essentially partake of the character of this winter.